Pizza has always been an intensely competitive industry: family-run pizza places compete against chains, while local chefs battle each other, trying to out-cook their competitors, and undercut each other’s prices. In the 1980s, across America, one of the greatest pizza wars in history took place, not between feuding chefs, but between a video game developer, an inventor, and a hotel chain manager. Also embroiled in the conflict were a dog, a cat, a pack of wolves, a handful of bears, and the world’s most famous animatronic rat: Chuck E. Cheese. The battle hinged not on pizza, but on robotics. The first Chuck E. Cheese’s Pizza Time Theatre opened in San Jose, California in 1977. In addition to pizza and arcade-style video games, it featured a live show starring a cast of animatronic performers, led by the eponymous Chuck, a robotic “New Joisey Rat” with an attitude. The combination restaurant and entertainment center was the pet project of Nolan Bushnell, the founder of Atari and inventor of Pong. At the time, Bushnell was selling Atari consoles to arcades: though he made $1,500 for each console sold, arcades were reaping in profits in the tens of thousands. Bushnell started thinking of ways to get into the arcade game, and came up with the idea for the Pizza Time Theatre. "The reason for doing the animals,” he explained, in a 2013 interview with The Atlantic, “was not for the kids. It was meant to be a head fake for the parents.” Predicting parents would be reluctant to bring their children to an arcade, Bushnell devised a novel – and importantly, free – entertainment to draw families to his restaurant: animatronic performers. In addition to Chuck E. Cheese, the act consisted of Jasper T. Jowls (a hound dog), Crusty (a cat), the Warblettes (three magpies), and Pasqually (a pizza chef, and the only “human” cast member); the robots hung in giant picture frames on the walls of the first Pizza Time Theatre, performing pop songs and cracking surprisingly risqué jokes (the original Chuck E. Cheese even smoked a cigar). According to Bushnell, “If you listened to the dialogue, it was fun, edgy stuff, kinda like Toy Story, written as much for the parents as the kids." Bushnell had his robots, but he needed investors. He teamed up with Bob Brock, chairman of the Brock Hotel Corporation, one of the largest franchisees of Holiday Inns. Brock promised Bushnell financial support, and Bushnell, in return, promised Brock the best animatronic technology in the world. 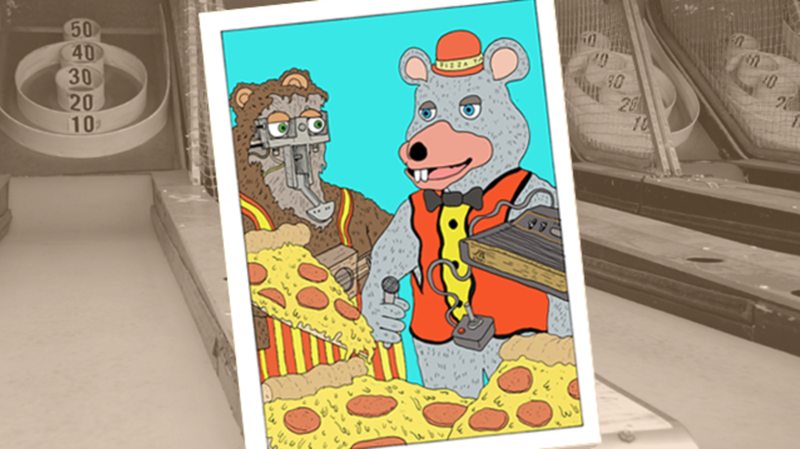 Bushnell told Brock that the Chuck E. Cheese “Pizza Time Players” (as the robot group was originally called) were not only the best – they were the only animatronic characters outside of the Disney parks. And that's when things started to fall apart. In 1979 Brock met a young inventor named Aaron Fechter. At 28, Fechter had a string of unsuccessful inventions under his belt including a fuel-efficient car that looked like a golf cart, and a pool cleaning machine that he’d attempted to sell door to door. Fechter had also created and lost the rights to Whac-A-Mole before diving into animatronics. When Brock met him, Fechter had just finished building an animatronic musical act called “The Wolf-Pack Five.” Brock instantly realized Fechter’s animatronics were more advanced than Bushnell’s. Their movements were more subtle, their facial expressions changed, their lupine drummer could really play the drums. Brock cancelled his deal with Bushnell and teamed up with Fechter’s company, Creative Engineering, to start the ShowBiz Pizza franchise. This “betrayal” launched the war between ShowBiz and Chuck E. Cheese: a war, incidentally, that Fechter and Bushnell both ended up losing. The first ShowBiz Pizza location opened in Kansas City in 1980 – three years and 1,800 miles away from the first Chuck E. Cheese location – offering a suspiciously similar combination of pizza, video games, and performing robots. Instead of Chuck E. Cheese and his “Pizza Time Players,” the ShowBiz show featured the Rock-afire Explosion, an animatronic band which included a wise-cracking polar bear, an alcoholic bird, a wolf ventriloquist, and “Billy Bob Brockali,” a good-natured “country bear” named for ShowBiz founder Bob Brock. Rock-afire inventor Aaron Fechter, meanwhile, was in heaven. For years, he’d been struggling to get his inventions off the ground, and now, with a 20% share in the ShowBiz franchise (Brock held the other 80%), he finally had the financial backing and creative freedom he'd dreamed of. His Rock-afire performances became increasingly complex. He handed the financial management of Creative Engineering over to his father, and focused full time on devising Rock-afire acts, overseeing everything from programming to choreography, and even providing voices for several Rock-afire characters. The Rock-afire explosion began churning out covers of hit ‘60s and ‘70s pop songs (legend has it that when Michael Jackson heard the Rock-afire’s Beatles medley, he decided on the spot to purchase the entire Beatles catalogue) as well as original numbers. Programming the choreography was a laborious process. Each eye roll, head bob, and wave of the hand had to be programmed individually – a process that took hours. For Fechter, the goal was to turn animatronics into a fully realized art form. He dreamed of becoming the next Walt Disney, and even went as far as to call his animatronic characters “the greatest entertainment medium to come out of the 1980s.” In an early ‘80s interview with Fortune magazine, Fechter explained, “Brock’s benefiting financially from the deal - he’s making money - but I’m going to change the world.” But Fechter’s days of unrestrained invention wouldn't last long. Over at Chuck E. Cheese, Bushnell was incensed by Brock’s betrayal, and launched a lawsuit against ShowBiz Pizza. It was the first shot fired in a lengthy battle. Brock shot back with a countersuit, citing misrepresentation. After lengthy negotiations, ShowBiz settled in 1982, and agreed to pay a percentage of their profits to Chuck E. Cheese for the next fourteen years. Though Bushnell emerged as the winner, his victory was short lived: in 1983, the market for video games crashed. Market saturation and the rise of the home computer were largely to blame, but two Atari games actually played a role in tipping the scales against video games: Atari’s 1982 version of Pac-Man sold incredibly well, but contained numerous bugs and glitches; their follow-up, E.T. The Extra-Terrestrial, was even worse. Hastily programmed in just five weeks to coincide with the release of the film, the game failed so spectacularly, Atari was forced to bury the extra copies in a landfill in New Mexico. Consumers, growing tired of the glut of poor quality games, began turning away from video games altogether. Since ShowBiz and Chuck E. Cheese were essentially glorified arcades, the crash had a serious impact on both businesses. Though both were stretched thin by the crash, Chuck E. Cheese was hit harder. Bushnell had racked up somewhere in the realm of $22 million in debt by using Chuck E. Cheese money to fund other start-up ventures, and was forced to file for bankruptcy in 1984. Bushnell was pushed out and ShowBiz snapped up the failing franchise. It continued to operate both Chuck E. Cheese and ShowBiz locations independently (by that point, it’s likely Chuck E. Cheese was simply too popular a character to kill off) and renamed the company Showbiz Pizza Time. Brock and Fechter were victorious. But once again, victory was short lived, this time for Fechter. ShowBiz was still losing money, and management decided the increasingly elaborate and expensive Rock-afire Explosion acts were in part to blame. They began phasing Fechter out, using voice impersonators to play his characters. Fechter, growing increasingly disillusioned with ShowBiz, began turning to other projects: in addition to building a series of new animatronics and high-tech Rock-afire toys, he started work on the “Anti-Gravity Machine,” a predecessor to email, which could send messages over telephone lines. Finally, in 1990, Fechter’s company, Creative Engineering, was ousted from ShowBiz completely: like Bushnell, Fechter had lost the war. But Fechter didn’t leave empty-handed: he took the Rock-afire Explosion with him, refusing to sell ShowBiz the character rights. Convinced the Rock-afire characters had a future independent of ShowBiz – in movies or TV – Fechter decided to keep working on the robots. Without the rights to the Rock-afire Explosion, ShowBiz was forced to convert the remaining Rock-afire robots into Chuck E. Cheese characters, replacing their exteriors, but leaving the original machinery intact. The creepy process, called “Concept Unification,” can be seen here . In the years since the robot pizza wars rocked America, Chuck E. Cheese has continued to thrive. In 1998, the company once known as Showbiz Pizza was rebranded simply as CEC Entertainment; CEC has gone on to become the 10th top selling pizza franchise in America with $405 million in sales in 2014. Though much has changed over the years – Chuck, for instance, has been turned from a rat into a mouse – Chuck E. Cheese remains one of the hottest party spots for the under 10 crowd. Bushnell, meanwhile, has continued to launch startups and develop videogames since losing Chuck E. Cheese in 1984. His latest projects include a series of “anti-aging” games, and Brainrush, a software company that turns educational subjects into video games. Fechter, too, moved on to other inventions. Unfortunately, his latest project – a new alternative fuel called Carbohydrillium – has experienced some major setbacks. Recently, a high-pressure bottle of Fechter’s Carbohydrillium exploded, nearly demolishing the Creative Engineering warehouse. Fortunately, Fechter’s remaining Rock-afire Explosion robots were largely unharmed by the blast. In fact, after years of obscurity, the Rock-afire made something of a comeback in 2008, when ShowBiz superfan Chris Thrash began filming new Rock-afire productions and uploading them to YouTube. With Fechter’s approval – and occasional assistance – Thrash programmed the Rock-afire Explosion to perform contemporary pop songs (including Usher’s “Love in the Club” and Nine Inch Nails’ “100,000,000”), uploading the videos to YouTube, where they garnered thousands of views. In the end, though Fechter and Bushnell have moved on to new endeavors, the pizza wars – and the ultimate loss of their companies – left a bad taste in both their mouths. Recently, when Bushnell was asked about his battle with ShowBiz he responded, “If you can’t say something nice, don’t say anything at all.” Then, he launched into the full story of his battle with Brock and Fechter.